Ireland celebrates its patron saint St. Patrick on the 17th of March each year. Dublin stages the biggest and most extravagant St. Patrick’s Day Parade outside New York. Literally half of Dublin’s one million population plus more than a hundred thousand visitors from all over Ireland and from abroad line the parade and turn it into Ireland’s largest street carnival. On St. Patrick’s Day Dubliners wear something green, a t-shirt, sweatshirt or even an odd scarf will do, and watch the parade before drowning the shamrock, that is they are having a pint in one of the many pubs lining the route of the parade. 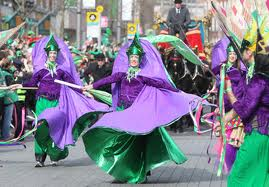 More than 675,000 revellers watched the 2009 parade through Dublin’s streets. Marching bands from Ireland, Europe and the USA partake in the parade. The music played at the parade ranges from Irish pipe and drum marches to current chart hits and bands compete with each other in costumes and dance routines. The award for Best Marching Band in 2009 went to a German carnival band from the Black Forest. A typical Dublin St. Patrick’s Day Parade also features a dozen or more floats and pageants, all extravagantly decorated. Every year, the Dublin parade is traditionally closed by the roar of engines of the city’s motor bikers on their Harley Davidsons and Honda Gold Wings. Over the years, an ever increasing number of events have been launched to warm up Dubliners and tourists alike for the parade day. Comedy, theatre, music, arts and sports events now form part of the official St. Patrick’s Day Festival which lasts for up to a week before the parade takes place on the 17th of March. Many of the events are free and there is a good choice of activities for families with small children. 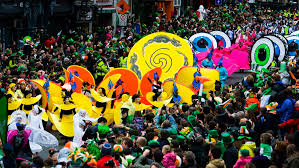 The route for the Dublin St. Patrick’s Day Parade is 2.5 kilometres long and leads from Parnell Square on the city’s Northside down O’Connell Street, over the River Liffey via O’Connell Bridge into Westmoreland Street, past Trinity College at College Green and on to Dame Street. It then turns left at Christchurch Cathedral into Lord Edward Street, Nicholas Street and Patrick Street before finally finishing at St. Patrick’s Cathedral. It is strongly advisable to be at the parade route before 10:00 on the day. The route gets crowded fast and the best spots will be gone well before noon. The Parade starts from the northern edge of Parnell Square, near the Hugh Lane Gallery, at 12:00 noon. It then winds its way slowly down O’Connell Street, past Trinity College at College Green and on to Dame Street before it finishes at St. Patrick’s Cathedral. The entire parade lasts approximately two hours. Festivities spill over into Dublin’s pubs after the parade has passed. On St. Patrick’s Day, Dublin is at its most mellow from 14:00 to 18:00. By then you have seen the best. After 18:00, the locals head for home or their local pub to end the day’s festivities on a quiet note. Grandstand tickets now on sale for 2014 St. Patrick’s Festival Parade. Tickets cannot be used as part of any marketing, media or sales promotion, whether commercial or non-commercial, without the prior written consent of St. Patrick’s Festival. The parade is suitable for children of all ages. Like at all large scale events, parents should be aware that the crowds of visitors make it difficult for kids to see much of the action and that moving through the crowd with small children often requires patience and nerves of steel. You will likely end up carrying your toddler on your shoulders for much of the day. Public transport in the city centre on St. Patrick’s Day is restricted due to the parade, particularly bus services and the Red Luas tram line. All the main DART stations are operating, however. The closest DART stops to the route of the Dublin St. Patrick’s Day Parade are Connolly and Pearse Street. Buses to St. Stephen’s Green and the Green Luas tram line are convenient if you want to watch the parade on the second half of its route between College Green and St. Patrick’s Cathedral. You can experience the parade as a participant rather than a spectator, marching in procession along the streets of Dublin City. This really is a once in a lifetime chance to experience the atmosphere of the festival from within the parade. The parade route marches past landmarks such as the GPO, Trinity College, Dublin Castle and Dublin City Hall. You can register your participation as an independent traveler or a group. You can find further details at the St Patrick’s Day Website . The St. Patrick’s Day Festival is also looking for volunteers for the weekend’s events. If you have some time on you hands on this particular weekend, it is a great opportunity to meet new people and really share in the event experience. Follow this link to send application request. 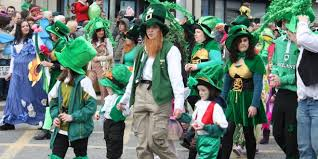 The entire weekend of St Patrick’s Day celebrations takes place from Thursday 14th to Monday 18th March. If you have not booked accommodation already, we highly recommend booking as soon as possible to avoid any disappointment. Our team at My Holiday Ireland can send you any advice needed about your trip to Ireland.